Cakewalk Catering is Muskoka’s newest and freshest supplier of all things sweet. Whether you are planning a wedding, birthday, special anniversary or a corporate function, Cakewalk can create a cake, cupcakes or confections that will wow your guests. Every order from Cakewalk Catering located on Lake of Bays, Muskoka is hand made from scratch daily. We use the freshest and most natural ingredients available in every season. Each item on our menu is baked and hand decorated by pastry chef and Canadian Culinary Federation member Rebecca Bell. Rebecca has lived and worked in the area’s resorts for the past 20 years. 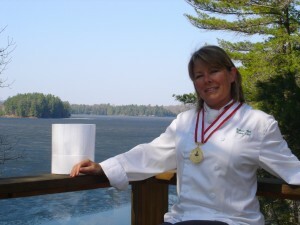 She discovered her passion for baking at Lumina Resort http://www.luminaresort.com and further honed her pastry skills for 5 years at Deerhurst Resort. http://www.deerhurstresort.com Rebecca combines her years of baking experience with her artistic side to create custom designed cakes, cookies, and confections. She is happy to consult with you by email to create a design with your personal taste and style as top priority. Cakewalk is a studio business so cakes are available by special order only. We recommend at least 2 weeks notice for your party cakes and at least 6 months notice for your wedding cakes. However, we would be happy to discuss squeezing you in to our schedule when it is possible.